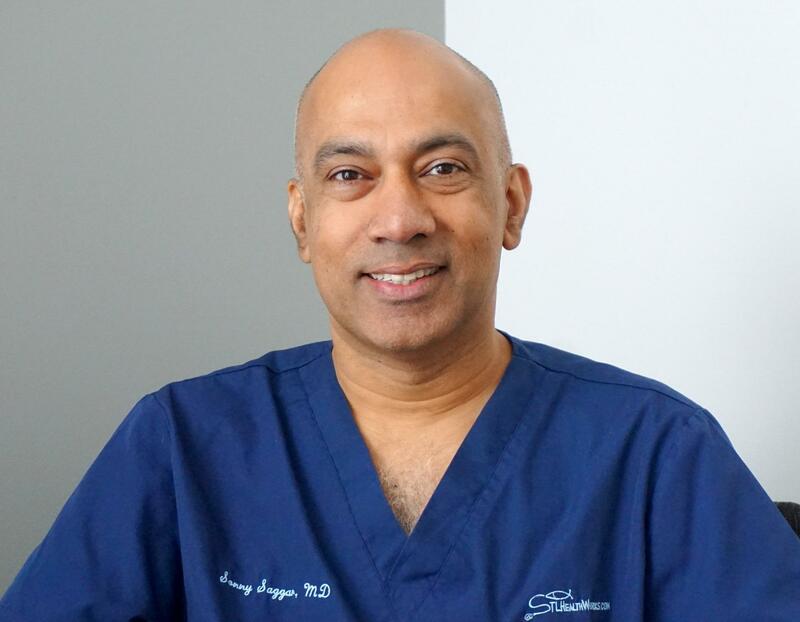 Dr. Sonny Saggar has practiced medicine in the St. Louis region for many years but grew up in England. He's worked in hospital emergency rooms in both countries. After a tweet by the National Rifle Association last week suggested that medical professionals should “stay in their lane” when it comes to guns, many U.S. doctors responded with messages of their own. Dr. Sonny Saggar, a St. Louis physician, was among those insisting that the issue of gun violence actually falls well within their lane. Until last December when he started focusing solely on the 24-hour Downtown Urgent Care business he owns, Saggar had worked for many years in hospital emergency rooms around the St. Louis region. He grew up in England and also worked in the ER there before moving to the U.S.
During his 21 years in American medicine, he’s observed many of the bodily and psychological results of gun violence – for those killed and injured, for loved ones and bystanders, and also for colleagues. Saggar touched on some of his own personal leanings with regard to issues such as gun control, as did several listeners who joined the conversation via phone. The doctor also urged community members to think about responsible gun ownership and take proactive measures, such as removing guns from a home where children live. “If you can’t do that, then [practice] safe storage and safety measures like a loading indicator or a child safety lock on the gun … these things have actually been proven to help reduce gun accidents,” Saggar said. He added that he thinks it is appropriate for physicians to ask parents and adults about guns. Before discussing several other topics connected to public health, he emphasized his deep concern about American gun culture – something he said he struggles to explain to friends and family abroad. On Friday’s St. Louis on the Air, host Don Marsh went behind the headlines to discuss the local Jewish community’s reaction to last weekend’s tragic event in Pittsburgh at the Tree of Life synagogue, where 11 people were killed. “It feels like we’ve seen this uptick in anti-Semitism for a while now,” Rabbi Amy Feder of Temple Israel in St. Louis County told Marsh. Also joining the conversation was Karen Aroesty, regional director of the Anti-Defamation League. In St. Louis, health care workers are volunteering their time — and in some cases, their own money — to train bystanders how to control life-threatening bleeding. The goal is simple: keep trauma victims alive long enough for them to reach a hospital. Stop the Bleed STL offers free classes at locations throughout the greater St. Louis region, including schools, community centers and churches. The program, which is affiliated with the national Stop the Bleed campaign, focuses on areas with high rates of gun violence. A year after the Las Vegas shooting that left dozens dead and hundreds injured, Manchester United Methodist Church held its own public discussion on gun violence throughout the St. Louis region. What some expected to be a heated debate turned out to be a peaceful discussion on how Moms Demand Action and the U.S. Attorney of the Eastern District of Missouri are working to curb gun violence.